Preheat oven to 400. If shrimp are still frozen, place in colander under cold running water. Set aside to drain. Place quinoa in a saucepan, add enough water to come ¼-inch above the quinoa. Bring to a boil, cover and reduce heat to low. Simmer 10-15 minutes or until water is absorbed. Remove from heat, keep covered, and rest 5 minutes before fluffing with a fork. Season with salt & pepper. Continue with next steps while quinoa is cooking. Thinly slice fennel and blood orange. Tear off a foil sheet large enough to create one packet for the shrimp, fennel, orange and chiles. Working on top of a baking sheet, place shrimp, fennel, blood orange, and chiles (use all of some of the chilies, depending on your heat tolerance) on the foil. Drizzle with olive oil, season with salt & pepper, and toss to combine. Fold foil over the ingredients and crimp the edges to seal completely. Place into the oven and set a timer for 15 minutes. Meanwhile, thoroughly rinse rainbow chard and shake off excess water – it’s ok to leave some water clinging to the leaves. Remove leaves from the chard stems—do not discard the stems. Slice leaves into ½-inch ribbons and stems into ¼-inch slices. Thinly slice garlic. Set aside. When the 15 minute timer is up, unwrap the foil packet and set oven to broil. Broil until shrimp are cooked through, tossing mix once if it appears to be browning to quickly. While shrimp are under the broiler, heat a small amount of oil in skillet over med-high heat. When oil is hot, add rainbow chard stems and cook 5 minutes or until softened. Add sliced garlic and rainbow chard leaves, cooking quickly until leaves have softened. Season with salt & pepper to taste. Divide quinoa between plates and top with contents of shrimp packet. Sprinkle with fennel fronds. Enjoy sautéed chard on the side. 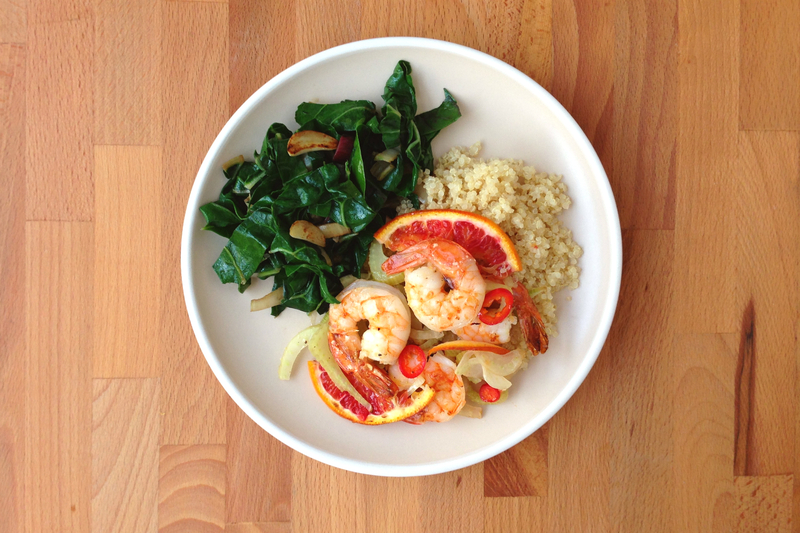 This entry was posted in Meal-Kit Recipes, Seafood on February 7, 2016 by Megan Rappe.